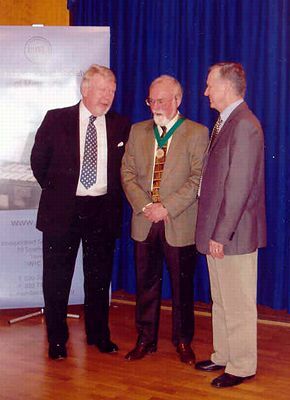 John McCabe has been honoured with the Incorporated Society of Musicians' Distinguished Musician Award for 2003, and was presented with the Award at a ceremony in London on March 27th 2004. The ISM Council makes the Award to acknowledge a colleague's outstanding contribution to British musical life. Previous recipients include Sir William Walton, Sir Peter Pears, Sir Adrian Boult, Jaqueline Du Pré, Sir Michael Tippett, Sir Charles Groves and Witold Lutoslawski, among many other distinguished names. McCabe was nominated for the Award by Kenneth Hÿtch, the ISM's Council member for the Society's Eastern region. His citation begins: "The phrase 'all-round musician' is surely no more aptly applied in the contemporary musical scene than to John McCabe - a world-renowned composer, pianist, administrator, musicologist, and author, with a prodigious CV to his name." Kenneth Hÿtch at the ISM Award ceremony.